Hello and welcome to another in our series of polls, as well as an update from one of our favorite sponsors. But first, news about a visit to Scotland tomorrow (Tuesday, Jan 29) for the Earl and Countess of Strathearn, as William and Kate are styled in that country. Below, a tweet by Joe Little of Majesty Magazine explains the purpose of the trip. 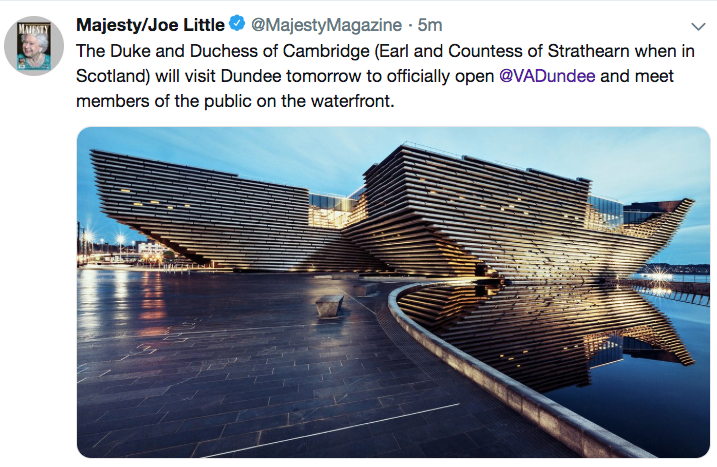 Tuesday, January 29: The Earl and Countess of Strathearn will visit Dundee, Scotland, where they will officially open the V&A Dundee, the country’s first design museum and the only V&A museum outside of London. As patron of the V&A, Kate will deliver a speech, and the couple will also do a walkabout on the waterfront. A look at the museum. This will be the couple’s second trip to Dundee; you may remember their October 2015 visit. This should be a terrific engagement, the new museum is stunning and it will be fun to have a look inside. Today we’ll look at the new coats Kate wore in 2018. After looking at all of the photos from engagements I pondered the best way to categorize things because we had multiple instances where the Duchess wore something referred to as a “coat” in the information released to the media by Kensington Palace, but it really didn’t strike me as something many of us would consider a traditional coat. I’m thinking of pieces like this. 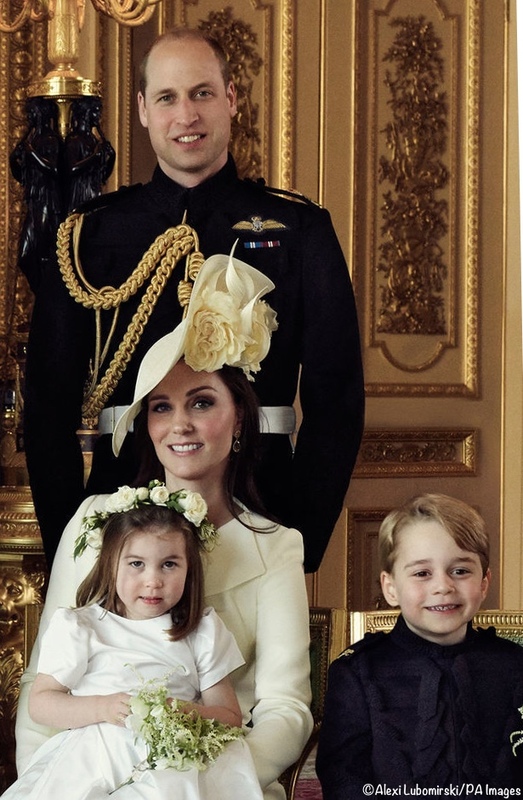 The official description provided by the Palace was “primrose yellow wool silk tailored coat by Alexander McQueen.” That seems a different type of garment from the majority of new outerwear we saw in 2018. It seemed we might want to revisit the categories, so I asked for input on Facebook and received very helpful input. Thus, this year’s coat poll includes the traditional coats Kate wore; the coatdresses and ensembles will be in a separate poll. Nor are the casual jackets included in this poll. We begin with a new piece from Hobbs worn in early January for a visit to Reach Academy. Called the Gianna, the coat is inspired by a traditional riding coat and made in a wool/poly blend. The midi-length design features double-breasted styling with a deep inverted pleat at the back creating a flared skirt. The Gianna also features a wide curved collar, notched lapels, pewter buttons, and side welt pockets. When visiting Great Ormond Street Hospital in mid-January, Kate debuted a coat from a brand new to her closet (as far as we know), British retailer Boden. The Duchess wore the label’s Lena Coat ($330) in a color called red pop. The vivid red-orange piece was 100% cotton and tailored with a snug bodice and a slightly fuller skirt; it also features oversize buttons and ruffled trim at the collar, cuffs and pockets. For the first engagement of the Sweden/Norway tour, Kate waved the British retail flag, wearing Burberry’s Toddingwall Shearling Trench Coat. A double-breasted style, the Toddingwall featured traditional Burberry trench details like buckled epaulets and cuffs, multiple pockets and a belt. The afternoon activities in Sweden were more formal and Kate changed into a Catherine Walker ensemble that included a deep green coat with attached faux fur trim at the collar and cuffs. The coat is a fit and flare silhouette with oversize buttons at the off-center closure. Day 2 of the royal tour we saw another Catherine Walker design. The double-breasted style hit just above the knee, showcasing an oversized red and ivory houndstooth print with red buttons. At a celebration of Swedish culture that evening we saw the Duchess wearing a local designer that has long been a favorite for Swedish royals and many others, Ida Sjöstedt. From the a/w 2018 collection, the ‘Antonia’ coat features an A-line silhouette and hidden button closure. The unique design element is the scalloped lace hem; we show it in the lower right-hand corner of the montage. For this engagement, Kate added the faux fur Troy London collar and cuffs she was mistakenly thought to be wearing with the green Catherine Walker coat. February 1st the tour moved to Norway and Kate arrived in another bespoke Catherine Walker design. The tailored coat featured a hidden front closure, funnel neck, princess seams, and a deep back vent. On the final day of the tour in Oslo Kate sported Dolce and Gabbana outerwear. The wool coat was a deep plum color in a double-breasted style that featured peaked shoulders, slanted oversized flap pockets, inset fabric panels on the bodice and a broad collar. For an early February Action on Addiction engagement, Kate was in a coat by Goat Fashion. The marine blue Ellory included a high collar, diagonal front pockets and concealed fastenings on the front placket. Arguably the most distinctive design element is the perky bow at the neckline. The Duchess debuted another Dolce and Gabbana coat for a day of engagements in Sunderland, in northeast England. It is another double-breasted style that showcased extended rows of oversized buttons, giving it a military feel. The coat also had pick-stitching on the front panel, princess seams and front pockets. 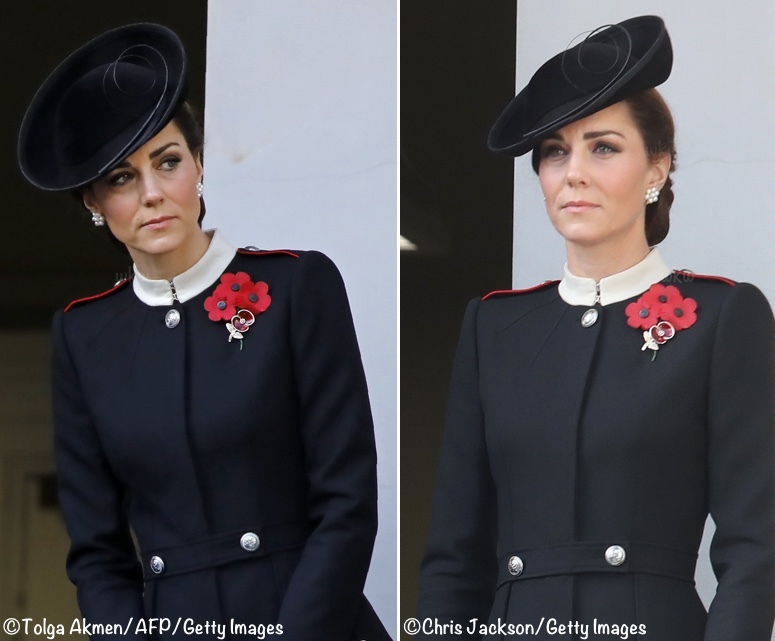 Remembrance Sunday 2018 brought a new design by Alexander McQueen. The nature of the event means we can only see the garment from the waist up and we don’t really know if it is a jacket or a coat. I have waffled on that issue, long having thought it was a jacket and matching skirt or possibly a dress, but when working on the polls, it occurred to me it could be a full-length coat. Thus it’s inclusion in this post and poll. The design has strong military references, including the shoulder epaulets and their red piping, metal buttons, and high collar. Christmas Day 2018 brought another Catherine Walker coat in a rich berry hue. The double-breasted style is becoming something of a signature look for the Duchess; most readers know Kate has an almost identical coat in green. The coat hits below the knee, has a fit and flare silhouette, angled pockets and velvet trim accenting the collar, cuffs, pocket flaps, and buttons. NOTE: Elizabeth shared in a comment that the poll doesn’t work for her when she is using the Firefox browser. I am able to see it in Firefox, but am looking into the issue. If anyone else is encountering problems, please let me know via comment, email, whatever works best for you. Also today, a look at the latest from a favorite sponsor here at WKW, Lacorine. 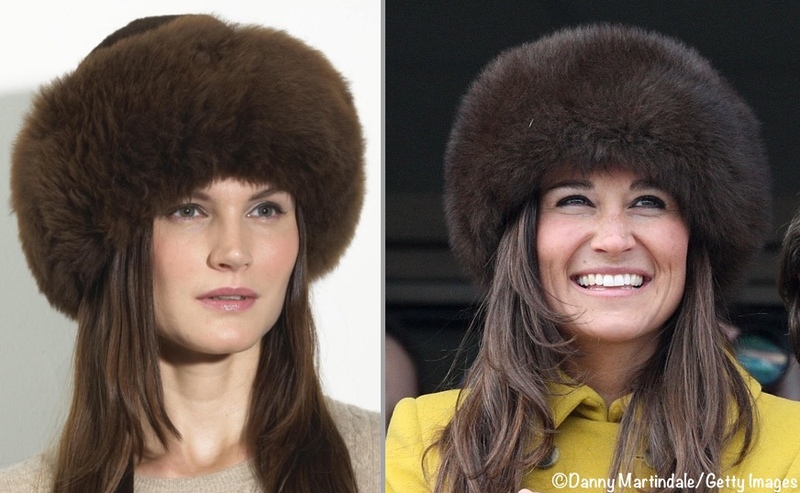 I think many of you will recognize the company name; we’ve seen the Duchess sporting their alpaca fur hats on multiple occasions. Below, Kate accessorizing her Moloh ‘Turpin’ tweed coat when at Sandringham just about a year ago. She is wearing the Lacorine Sumac Hat in chestnut brown. Lacorine was started in 2006 by Antonia Valentin Jacob, who now lives in England, but grew up in Peru. 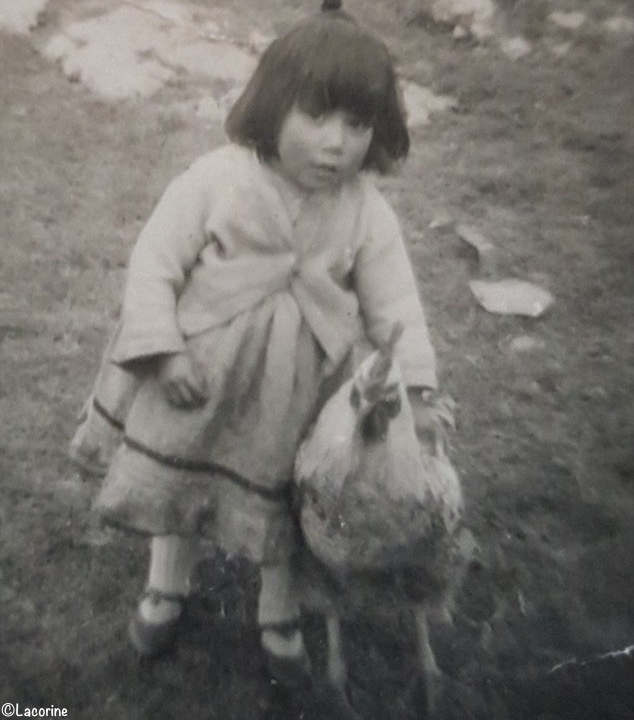 Below, Ms. Valentin Jacob as a child in Lima, Peru. 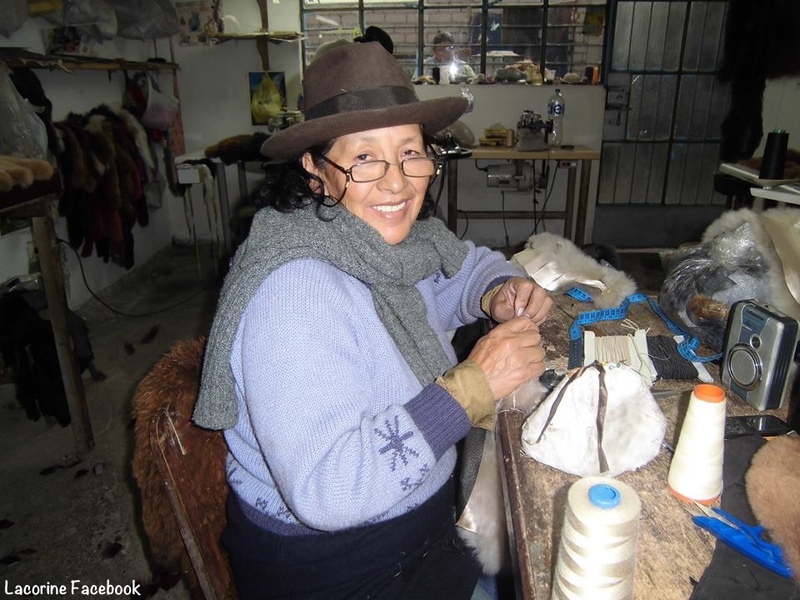 She travels there several times a year to source materials; the Peruvian alpaca fur used for merchandise is from animals that died naturally, most often from Peru’s harsh winter climate. Our clothing is designed by me and handmade in Peru by highly skilled artisans who live in remote villages and use skills that have been passed down through generations. Finding these talented artisans is no mean feat and local knowledge and contacts are key. The fact that I’m from Peru has enabled us to create lasting relationships centred on trust and respect and the love of the alpaca itself. Ms.Valentin Jacob is committed to ethical, sustainable manufacturing, and Lacorine is Fair Trade certified. When you see a product with the Fair Trade Certified™ seal, you can be sure it was made according to rigorous social, environmental, and economic standards. We work closely on the ground with producers and certify transactions between companies and their suppliers to ensure that the people making Fair Trade Certified goods work in safe conditions, protect the environment, build sustainable livelihoods, and earn additional money to empower and uplift their communities. Lacorine’s Fair Trade principles are explained on the company’s website. 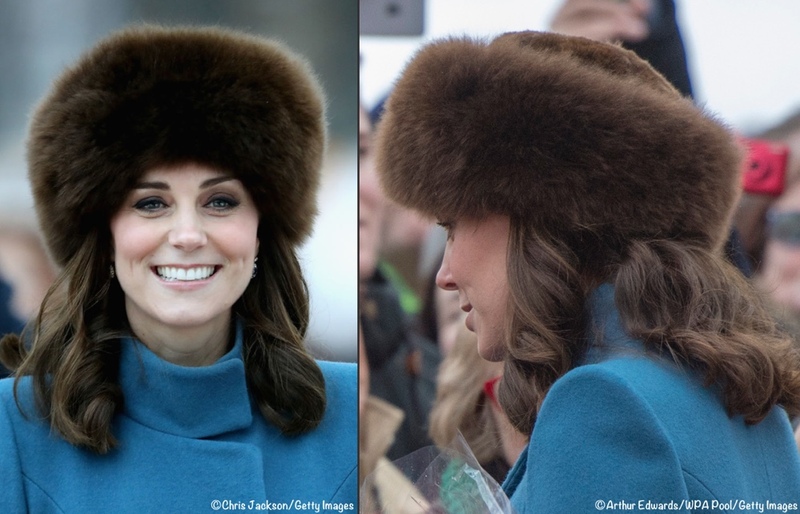 Now a little more about the hats Kate has worn. 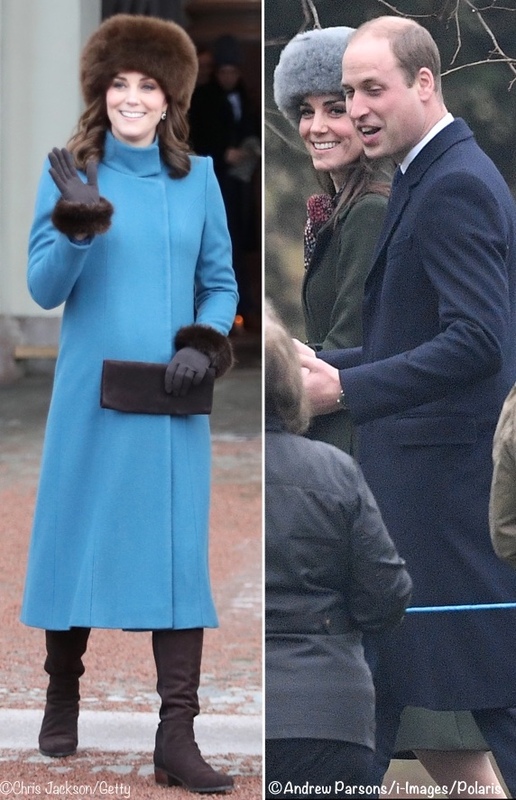 Below left, you see her in the Sumac style in chestnut brown when visiting Norway in February of last year; on the right, she wears the silver grey color when attending church services at Sandringham in January 2017. 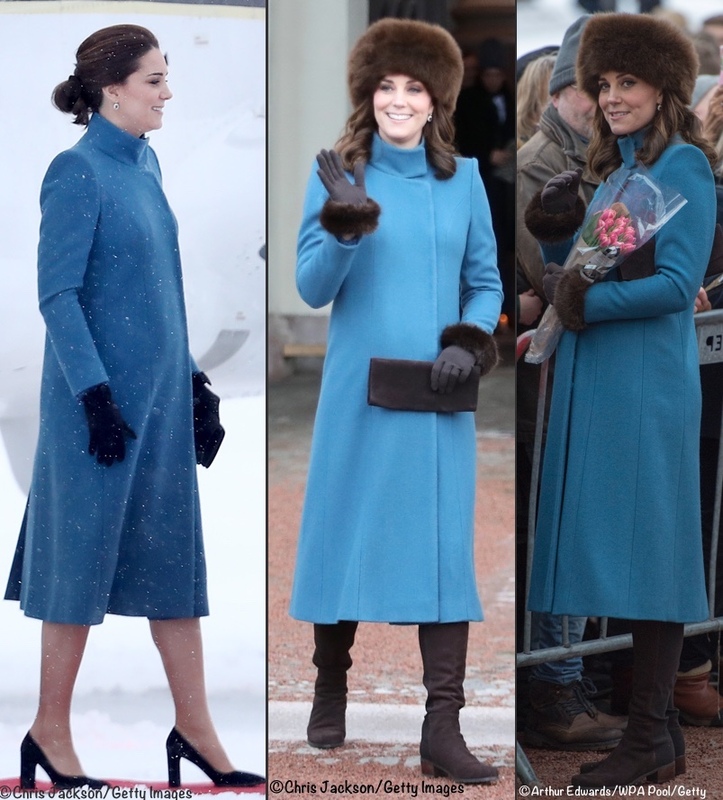 The Sumac is described as “Divinely soft, fluffy and warm, with a generous brim, our luxury alpaca hat is a knock-out – perfect for a winter wedding or the races.” Another look at the Duchess in Oslo. The hat now comes in ten colors and three sizes. Here you see (left to right): white, champagne, copper, chestnut brown and chocolate. It is also offered in silver grey, grey, red, a new cobalt blue color, and an always-in-style black. 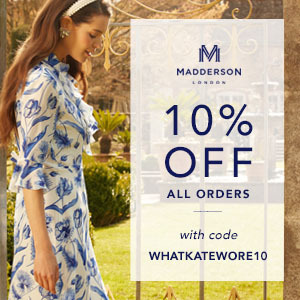 Pippa Matthews has also worn the brand. Here you see her wearing Lacorine’s Qori style in chocolate brown at Cheltenham in 2013. If looking for something a little smaller than a hat, there are also headbands. We show them along with the Twizzle Scarf. One of the newer items at Lacorine: Capes in 100% Peruvian baby alpaca woven fabric with alpaca fur trim. You will find a delightful selection of cute gift items at the retailer, like alpaca fur soft toys and pom-poms. 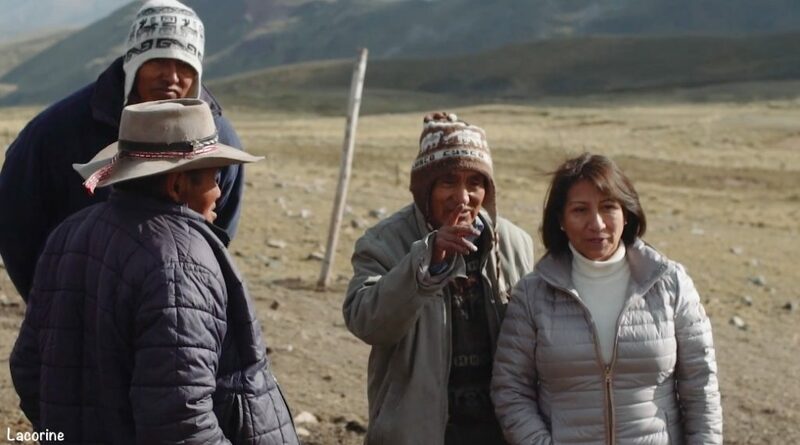 There is a terrific new video that covers the brand’s history while also showcasing Peru’s stunning scenery and the artisans who create Lacorine’s products. Anecdotally, in November we heard from a WKW reader who has shopped Lacorine. She left a comment on our after-Thanksgiving shopping post complimenting the brand, saying, “One site I love… is Lacorine. The knitted fur hats are wonderfully warm… Since we live in Alaska, I bought two of the Sumacs as gifts. Now we can all pretend to be as glamorous as KM.” Below, I believe these are the hats being referenced, the Alpaca Wool Pom-Pom Hat. You can also follow Lacorine on Facebook, as well as on Twitter and Instagram. This was such a tough poll because I liked just about every choice! Could have closed my eyes and just picked one (I finally went with the light blue Catherine Walker because it looked so nice when she wore it again to church). This is why I love polls – it reminds me of all the great looks I had forgotten about. So thank you, Susan! I love Catherine in coats that show off her beautiful legs. And she always looks great in the military style, double rows of buttons down the front and coat dresses that flatter her slender waist (even after 3 children). I liked all the coats except for the black coat she wore over the blue velvet Erdem dress. The hat in your post is wonderful!! I looked up the hat last year when Kate wore it and found it was from an American company. I purchased the grey hat and it’s fabulously warm, it has a satin lining. I actually wore the hat today while I was out (it was -3dF here). As always, your site is wonderful. Thank you for all your hard work keeping everyone up to date on What Kate Wore. I’m sitting out this poll. I love almost all of Kate’s coats. In fact I would be hard put to find more than one or perhaps two of 2018’s coats that I didn’t like. I just can’t narrow it down to one or even three coats that I like more than the others. I’m a coat person myself, although my current life circumstances mean that I don’t need more than two or three coats at a time, so seeing Kate’s huge coat wardrobe just makes me smiley and happy! I picked the Burberry Shearling Trench Coat because I find it more interesting than the double-breasted fit and flare coats people seem to like so much (quite honestly I find that look pretty boring and we’ve seen Kate wear so many coats in that style). While the Burberry coat also has a lot of buttons (Kate also really likes buttons and I’m surprised this site hasn’t documented her love of decorative buttons on coats!) it’s more visually interesting to me and more versatile than some of these other coats she’s wearing. Lovely website with really interestingly presented information. I also really like the commenters here: pleasant and polite, even if critical, the comments are seldom vitriolic. I love a lot of Cathrine’s coats and I’m a formal, structured coat person myself so that Remembrance Day McQueen is a make-the-Earth-move sort of coat for me – I dare say that I would declare that it is the best thing anyone has ever worn. That coat made me want to run out and get fitted for one to join my wardrobe – but then I remembered that I very seldom have a need to stand at the verandah of Buckingham Palace and wave at my adoring subjects. Bugger it! So, I have to contend with voting for that piece for the best coat of all time – Kate’s or anyone else’s. I can’t vote in Firefox, either. 🙁 I may try on my phone, though. Thanks for the great posts! What a difficult choice! I agree that the Duchess wears a coat so well. Longer lengths look dramatic on her and emphasis her elegant long legs. I would be curious to learn where her vast wardrobe is stored? I wonder if she wears her official wardrobe much (or ever) during her private life? I love the black watch coat she wore in Dundee and think it would look very nice with a wide black patent-leader belt over it. Many thanks for the very informative and interesting posts. I love the Duchess in a fit and flare style, so the Catherine Walker green and berry do it for me. I also liked the colour of the blue on her – I like it now she has had it refitted post-pregnancy too. I see the Remembrance Day black coat is very popular, but the details verged a bit too close to fancy dress for me, with the military collar, metal buttons and shoulder piping. A really difficult choice between the regal green Catherine Walker with the fur at the collar and cuffs, and the bold red and white houndstooth Catherine Walker! I ultimately chose the green, because I absolutely love that timeless cloth coat/luxe fur combination. However, I’m a fan of the houndstooth too, and Kate was spot on with her choice of accessories there– the brownish-burgundy Tod’s pumps, gloves and bag settled the look and kept the coat from screaming. This is a classic but fun look that I think she should mix in every now and then. When she does, it’s smashing. Thank you for all of the fantastic polls! Trying to choose a favorite coat is like trying to choose amongst a huge tray of luscious desserts! In the end I went with her Christmas Day coat, but it was a tough call. I live in the southeastern U.S. where we don’t need winter coats unless we travel to a colder region, but looking at these lovely coats makes me want to add a few to my own wardrobe. I am voting for the green Catherine Walker coat worn on the tour of Sweden. I love the duchess’s accessories with this ensemble. Everything came together perfectly. Besides the style and color factors, I am voting for it because it looks warm! An absolute must for a winter coat where I come from. Thank for the wonderful article about the Peruvian alpaca hats, as usual your research and writing are excellent. I was surprised to learn that the wool comes from dead alpacas in Peru, I took my granddaughter to our county fair last year and saw some alpaca on display, they all had short hair as if they had recently been clipped. I assumed they did that every spring like with sheep. Alpacas are shorn yearly, so anything made of alpaca wool is likely fibre from a living alpaca. I think some of the hats and such are made the way sheepskin coats are… the hide with fibre still attached. What a fun Poll you put together! My vote was for Burberry’s “Toddingwall Shearling Trench Coat.” Can’t pass up a trench coat and my vote was had when I looked it up on the link you provided and saw it paired with the Marc Jacob Pants. This is one versatile trench coat. Tomorrow’s visit to the V&A Dundee is super exciting. How creative is the design – inspired by a Scottish cliff face – and fitting for a Design Museum. I’ll await to hear more input about Kate’s coat dresses which I’m happy you’re saving for another day! They are ALL beautiful, but I have to give it to the Remembrance Day McQueen. Someone commented on that original post, “Queen Catherine,” and I have to agree. She absolutely knocked it out of the park as a someday queen consort on a historic and solemn occasion. This was hard! First I was torn between the Hobbs and the green Catherine Walker but then the berry one popped up and that was it! I love the back view of Kate in it – so 1940s! Kate and coats are a marriage made in heaven. She wears them so elegantly and regally, even when very pregnant.Then again, I’m a coat person, and must be prevented from purchasing as many as there are winter days. A very hard choice between the red and white houndstooth, the black McQueen, and the Xmas berry coat. In the end I chose the houndstooth for its dynamic look, and because I also admired the color of her accessories. They were different from what one might expect — red or black — and simply brilliant in the way they both matched the coat but were distinctively different from the bright red. That McQueen though — just gorgeous. I picked the Dec. 25 coat but I actually love all of Kate’s coats. I love coats and have a rather extensive collection of my own. I think she looks great in every one. P.S. : Those buildings are hideous!! They look cold and monstrous and will look dated in a few years, just as those awful buildings in Dubai and other of those rich oil countries. Buildings like that are more painful to look at in Scotland and other Western countries than in the Middle East. I seriously dislike them. Kate has quite the delectable collection if coats (this is a truth universally acknowledged!) It was fun to see a year’s worth featured here in one post. That military inspired Alexander McQueen got my vote because it stood out as such a style above her usual variations on the theme. Impeccable fit and I loved the color contrasts of the cream and red accents. But I wanted to vote for that bold houndstooth as well! (Those burgundy accessories pulled it down for me.) I do hope we see it again. I voted for the Navy Hobbs, although I can certainly understand votes for the Berry Catherine Walker. One thing this photo gallery highlights is how elegant Kate looks when she wears a longer coat. It was such a hard choice picking a favorite coat as I scrolled down the list and I thought I had worked out a favorite and then there was the merry red last one from Christmas day and all my prior deliberations went out the window. That is the favorite! It was so perfect for Christmas day and I loved it. Still adore the Remembrance Day Alexander McQueen though – that was a stunning look. And I really like the red/white houndstooth Catherine Walker as well. Good call on separating the coat dresses out from the coats. While they all may technically be “coats,” they are very different looks. Terrific news about Kate and William being in Scotland tomorrow – hope we get a new coat! Thanks for the poll, though I’m concerned to find at least two I’d clean forgotten – the Hobbs Gianna and the little Goat Ellory. I fear I may be losing my grip here 0_0 But I do definitely recall the wonderful bright orange check Catherine Walker in Sweden, one of Kate’s best picks of all time, incorporating enough classic tailoring to play safe, while delivering a real visual punch in that bold print. Just to let folks know, if you use Firefox as your browser, you cannot vote as nothing is ever there. You can use Internet Explorer. I voted for the black Antonia coat only because I see potential. I’d like to see it closed and without the fur dealies; I think the embroidery is stunning. Hi, Elizabeth, and thank you for the input about issues with the poll, that’s not good. 🙁 I did some research and found an item about a Firefox conflict with Firefox, but that is hypothetically corrected. I am able to see it and vote in Firefox, as well as Chrome and Safari (the Apple browser), but would love to hear from anyone else experiencing difficulty. Thank you for the heads-up, Elizabeth! I can’t see the poll area in Firefox either, and have had this problem for a while, with a bunch of earlier polls. Thanks for the blog though. I seldom comment these days, but read and visit religiously, so thanks for all the hard work. Thank you for commenting, and for letting me know about the Firefox issue! Yes, I failed to mention that this has gone on for quite some time. Thank you for reminding me, Marianne. I have had the same issues with this and previous polls this year…fortunately, IE works. Thank you for letting us know, Anna Marie! Tossup for me between the navy Hobbs, which I thought was understated but brilliant, and the bright blue Goat “Ellory.” I find my self wishing anew that she had pulled her hair back so we could see that beautiful bow detail on the Ellory! I’ve always loved the Lacorine hats, despite their detractors! I think the Duchess looks very beautiful in them–all gorgeous flowing hair and sparkling eyes. I agree with those two choices and also throw in the lovely red Christmas coat. So many beautiful choices this year! I think I have mentioned that I purchased the Ellory coat in black, on sale, before Kate wore it. I feel like a million dollars every time I wear it. It is very light so is not something I wear regularly during the day, but it is perfect over an evening or cocktail dress.